Well my very favorite day of the year happened just last week. It was Mia's birthday! 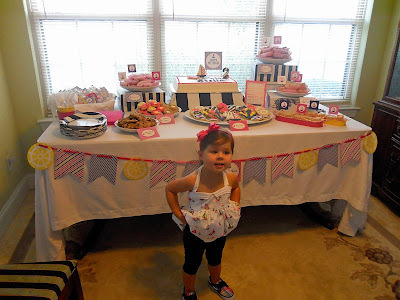 My little baking assistant turned 2 and we celebrated with a big fun party with friends and family. It was so perfect....all of our very favorite people were there, it was a beautiful sunny 80 degree day, the food and drinks were great, Mia looked adorable, and the cookies were SO. STINKIN. CUTE. Move over honeypots....there's a new favorite in town! Mia's party theme all started back in June when Rob and I were really considering celebrating her birthday with a party at the lake. You see, we go to the lake almost every weekend in the summer....but the problem is that the lake is 3 hours away. So as much as it would've been fun to share her day with the select family and friends that would have been able to travel, it was WAY more important to us that Mia could be around as much family as possible if the party was in Pittsburgh. 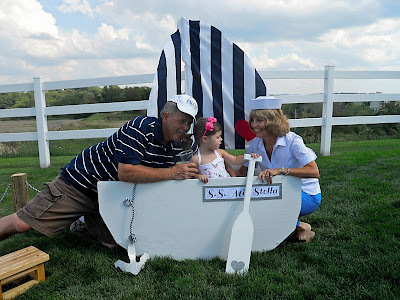 So we decided to bring the lake to Pittsburgh with a sailboat themed party! 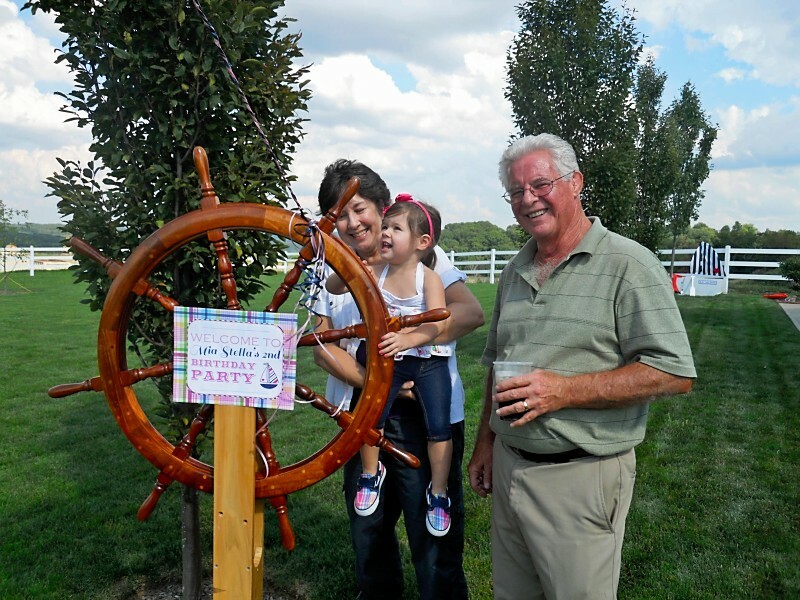 I can't tell you how many people were like...."A sailboat party? For a girl? That's weird." I was like....seriously? OK, so not that many people told me it was weird. OK, it was only one lady at Pat Catan's that said it....but it really bothered me. I mean...Mia is going to have so many years of telling me what kind of party she wants....and I can just hear it now....PRINCESS! FAIRIES! PINK PINK PINK! And that's all great and I can't wait to do those themes, too. But this year the theme was mine to choose....and Mia absolutely loved it! We told her about the upcoming sailboat party whenever we sent the invitations, so maybe a month before the party. And I'm not even kidding....this child did not stop talking about her birthday party even for a single day until the day of the event. She was so excited! Speaking of the invitations, I follow this amazing blogger/designer Anna and Blue Paperie on facebook. (You should follow her, too! I promise, you'll love it!) I was just meant to have these invitations because she posted the design within hours of deciding on our party theme. It was fate and I just fell in love with the colors, fonts, graphics and patterns. My brain immediately started designing the cookies to fit the theme. I couldn't believe that I had to wait weeks before having this party! I was like a kid at Christmas counting down the days. So maybe I went a little overboard with the details. No pun intended. But I just. couldn't. stop. I got so much of the Anna and Blue Paperie party materials printed at Kinkos. Seriously, I was there almost every day for 3 weeks picking stuff up. They now know me by name and that's pretty funny. Not only did I get party material printed, but I found amazing stuff at Michaels, Pat Catans, Walmart, the $1 stores, etc. Oh...and Etsy, too! It wasn't like I was on the hunt for particular things, but stuff would just jump out at me and I started a stockpile that quickly grew. It was nice, though because I had shopped over a period of a few months so it didn't seem like a huge budget-buster. And trust me, this party, much like everything else in our lives, was done on a budget. I'd go into details about my exciting finds but it would probably bore you. 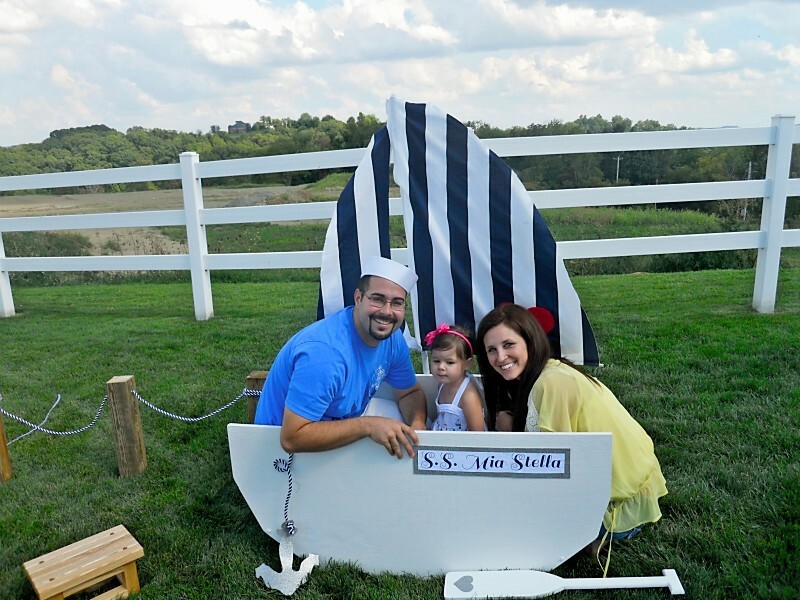 The best part about this party planning experience was the path that led to creating the "S.S. Mia Stella." One day while at the lake I said to Rob..."You know what? We should bring home that little row boat and set it out at the party for the kids to play on." And somehow instead of bringing home that already built boat, weeks later I found myself outside in our backyard in the dark, working by spotlight and flashlight, powertools in hand (definitely Rob's hands, not mine. That just wouldn't be safe people), drilling holes, and sawing wood, and we're building a play-boat for our daughter. How'd that happen? But let me tell you....that was one of those moments when I realized.....there's nothing that I wouldn't do for this child. And the fact that Rob and I built it together from just pieces of wood and fabric was really special to me. Rob and I are a really good team and we've always loved doing projects together. Surprise! I actually enjoy spending time with my husband! Unless it has anything to do with golf or eating seafood. He can do that stuff alone. 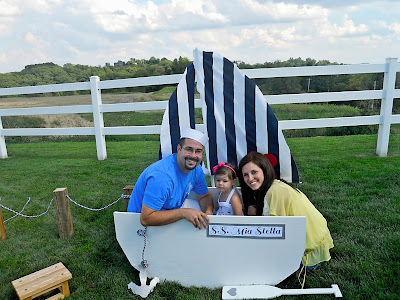 A few nights before the party we finished the boat by adding the sail and I dressed it up with some fun accessories.. Dock posts and all....that ship was ready to set sail at the party! What a beautiful day to sail! Another really fun part of the party planning was finding just the perfect outfit for Mia to wear. I'm NOT a big fan of spending a lot of $ on her clothes because it's just amazing how she manages to stain stuff in a matter of seconds. But for her birthday I just wanted her to have something special, you know? So I was searching online for some cute pink/navy outfits but nothing was really jumping out at me. Or if I did like something it would cost $50 and I wasn't prepared to spend that. So one day while meeting someone to deliver cookies at the Galleria (and I'm NEVER at the Galleria) I wandered into Janie and Jack just knowing that I would quickly regret it because everything there is so expensive. And then I saw it. A whole wall of nautical themed girls clothes that were pink and navy and sooooo cute. The line was called "Sail Away". I could've cried it was so pretty. Wait and get this....it was on sale! The cutest shirt in the whole store, the shirt that I could immediately picture Mia wearing was only $11.99. Sold. OK, and I bought a headband, too. It was only $2.99! This cute shirt paired with some jean capris and amazing pink and navy boat shoes found at Burlington for $4.99 and the outfit was complete. The cookies were a true joy to make. I was up verrrry late the night before the party finishing them, but it was so worth every lost minute of sleep. 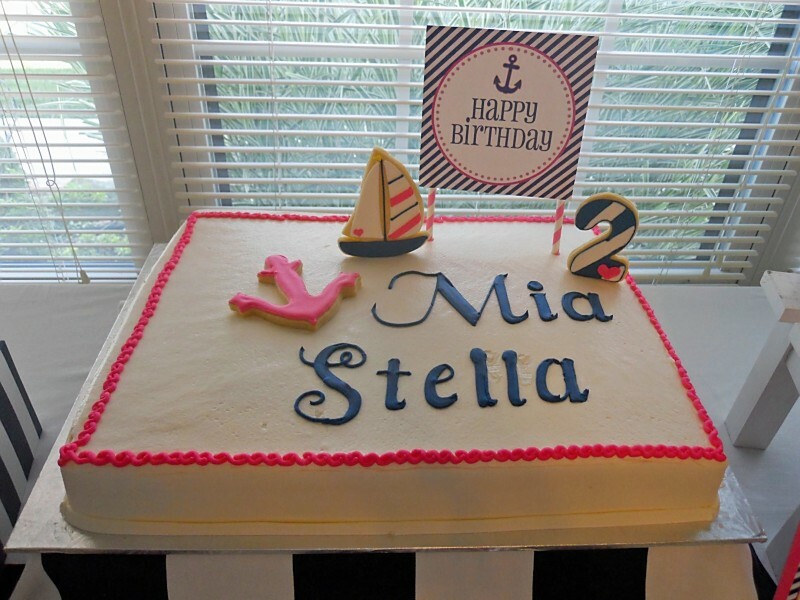 From anchors to sailboats, ships wheels to nautical stripes, pink and navy and yellow....true cookie love. I don't know that I'll ever make cookies that I'll love more than these. All for my Mia Stella. So the set-up of the dessert table went surprising smoothly. Last year I was a complete crazy person traying cookies and adding sprinkles all at the last second. This year, I got smart. Most of the cookies that I made were bar cookies so they were all made the day before, cut and stored in sealed containers, and ready to tray the day of. 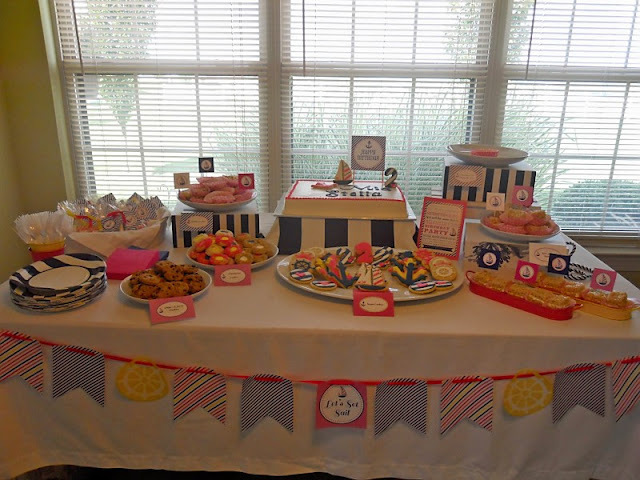 So I used all of my party supplies to set up the table, used my every day white pottery barn dinner plates to tray the cookies, and added the place cards which I had printed (at Kinkos!) weeks before. That was another key to not going completely crazy and overboard with the dessert table. I only made labels for the cookies that I planned to make. So the night before when I started having anxiety about not having enough of an assortment of cookies....there was nothing I could do....because there was no time to have more tags printed (although I probably could've called my new buddies at Kinkos at midnight and I'm sure they would've done it. OMG, I just realized that it's called The Fedex Office store now, not Kinkos anymore. Showing my age I guess. Whatevs, I'm still gonna call it Kinkos because I'm a regular there now...and regulars can do stuff like that). So anyway, the cookie table was done and I mean DONE an hour before the party even started. It was so enjoyable to not have to rush...and I loved how it turned out! notice that my stands are actually photo boxes flipped upside down. They can be found at Michaels on sale sometimes 3 for $5! All types of colors and styles! Chips AHOY cookies. I just couldn't pass them up at the grocery store. Witty, I know. Along with the cookie table we also had a drink station with pink lemonade and fresh iced tea. The paper straws were ordered from Etsy and I thought they were so fun. For a very small amount of money they added a lot of color to the party and people just raved about them. Of course they had Happy Birthday flags on them, too. Yes, I had to cut and glue each one of those flags by hand. What? Normal people don't do that kind of stuff at 3 am while watching Teen Mom on DVR? Oh. So Mia had an absolutely amazing day. She just loved playing with all of the kids and opening all of her fun girly presents. She smiled and laughed when everyone sang happy birthday to her and she blew out her 2 candles like a champ. And I cried. No surprise there. seeing her smile makes me so happy! on a side note....geeeeeez my hair is long. I gotta do something about that! all of the kids <3 ...and Becky, too :) wait! where's Cole??? So a big giant THANK YOU to everyone who came to Mia's party. She still talks about it every day and it just meant so much to her...and to Rob and I...that you were there. For now it's back to business as usual! The week after Labor Day is going to be quite a busy one for me so I'm going to enjoy the holiday and then it's major cookie craziness coming up in the fall and winter. I've got a full schedule for the entire month of September and I couldn't be more thankful. If you have any upcoming events in October and November please email me soon! Thanks!